Using Keck Observatory in Hawaii, astronomers have detected two Jupiter-like planets around the giant star HD 202696. The finding is reported in a paper published January 7 on the arXiv pre-print server. Located some 615 light years away from the Earth, HD 202696 (other designations: HIP 105056 and BD +26 4118) is a bright giant star of spectral class K0III/IV with an effective temperature of around 5,000 K. The star is estimated to be 1.32 billion years old, is about six times larger than the sun and has a mass of nearly two solar masses. HD 202696 was observed with High Resolution Echelle Spectrometer (HIRES) at Keck Observatory between July 2007 and September 2014. HIRES radial velocity measurements allowed a team of astronomers led by Trifon Trifonov of Max Planck Institute for Astronomy in Germany, to identify two planets orbiting the star. “We present evidence for a new two-planet system around the giant star HD 202696. The discovery is based on public HIRES radial velocity measurements taken at Keck Observatory between July 2007 and September 2014,” the researchers wrote in the paper. Data from HIRES indicate the presence of at least two strong periodicities near 520 and 940 days, with no evidence of stellar activity near these periods. This, according to Trifonov’s team, suggests the existence of a pair of Jovian mass planets, each with a minimum mass of around two Jupiter masses. 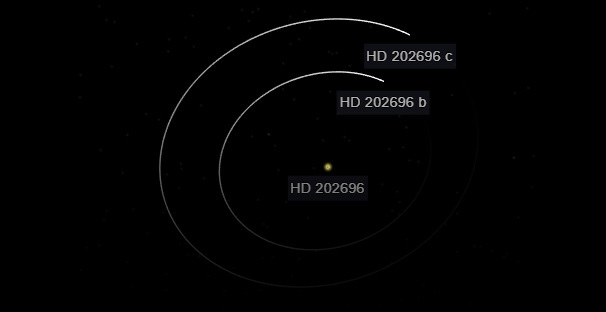 The newly found alien worlds received designations HD 202696 b and HD 202696 c. The planet closer to the host - HD 202696 b – orbits it approximately every one and a half years (520 days), at a distance of about 1.57 AU (astronomical unit). HD 202696 c is located some 2.34 AU from the parent star and it takes it more than two and a half years (940 days) to fully orbit the host. The astronomers calculated that HD 202696 b and c have minimum dynamical masses of about 2.0 and 1.86 Jupiter masses respectively. The authors of the paper noted that although the HD 202696 system in not unique when it comes to orbital parameters, it could be helpful in improving our understanding about formation of extrasolar planetary systems. “The HD 202696 system is yet another Jovian mass pair around an intermediate mass star with a period ratio below the 2:1 mean motion resonance. Therefore, the HD 202696 system is an important discovery, which may shed light on the primordial disk-planet properties needed for giant planets to break the strong 2:1 mean motion resonance and settle in more compact orbits,” the researchers concluded.